Granted, teenagers are fickle. So what is the trick for designing a teen bathroom that kids will not outgrow within a few years? We think the secret is to create something that feels both youthful and grown up. Functional features combined with fun colors or patterns are one way to get the job done. The following ideas share playful tips for designing a teen bathroom that the entire family would love using. This modern farmhouse teen bathroom by New York City based Chango and Company was created for one lucky teenage girl. The pink farmhouse pendant light over the vanity is a sweet touch with enduring style. The blue and white tile floor is a trendy update with real staying power. Another a la mode feature that will not feel dated anytime soon is the shiplap wall. Cortney Bishop Design out of Charleston, South Carolina, created this black and white teen bathroom. The trough sink accommodates three. Above the large mirror are three industrial inspired light fixtures. The black and white floor tile adds a pop of timeless pattern. Reflected in the mirror are built-in cabinets that provide plenty of bathroom storage. Nothing personalizes a space like an eye-popping feature wall. Case in point, the graffiti wall framed in marble in this teenage boy's bathroom designed by Estee Design situated in Toronto, Canada. On the wall are black square ceramic tiles. The porthole inspired mirror is a nautical touch that adds practical storage. Here is a blue and white bathroom for teens by New York City interior design firm Bella Mancini Design. Above the retro pedestal sink is a sunburst shaped mirror made of wood. On the floor is a handwoven towel basket. Another natural touch is the hanging macramé planter with room brightening greenery. The two-toned wall features white beadboard trim. What is covering the floor? Black penny round floor tiles with contrasting white grout. 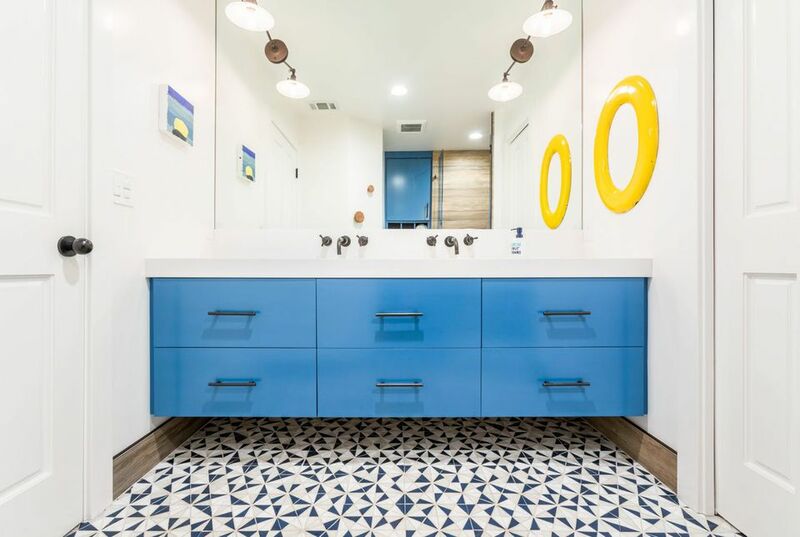 A vibrant color scheme makes a playful statement in this teen bathroom by Eberlein Design out of Philadelphia, Pennsylvania. Above the orange vanity are bubble style round tiles in various colors and sizes. Over the tub are blue, orange, teal, and white stripes made from rectangular ceramic tiles. Punch up a bathroom drenched in neutral shades with unexpected, bright accents. De-Spec, an interior design firm in New York City gave this small teen bathroom a big dose of personality with a hot pink facet and knob set. Sometimes all you need is a big jolt of color to make a white bathroom more visually appealing to teens. Redesign Right a decorating company based in West Chester, Pennsylvania turned a boring wall in this example into an eye-catching feature with turquoise paint. Make a teen feel grown up with a transitional bathroom that feels very adult like this one by Terra Cotta Design Build based in Decatur, Georgia. Covering the floor are penny round tiles made of durable porcelain. The countertops are quartz, which is both moisture and heat resistant. The blue shaker style cabinets whip up plenty of storage space. Two teen sisters share this retro-inspired bathroom by California based interior design firm Sabrina Alfin Interiors. The walls are painted a shade called Spirit in the Sky by Benjamin Moore. Black and white tile in classic art deco patterns cover the backsplash and floor. On the cabinets are frosted plastic knobs that resemble sea glass. New York City based Home Design and Remodeling created this modern rustic bathroom for a teenage boy. The black and white floor tile adds a show-stealing pattern. The rough-hewed cabinet, and matching shelves can be considered manly touches. Black shower and tub fixtures are a striking contrast against the white subway tile. Above the compact mirror is an industrial styled brass light. The interior design team at Studio McGee out of Utah admit that they do not typically use wallpaper. But they do believe that installing it in a bathroom for teenagers is an excellent idea. For instance, the whimsical, yet grown up wallpaper shown here. The designers picked the pattern because it would not feel childish as the teen as get older. If you ever shopped around for water resistant wallpaper suited for bathroom use than you know it can get pricey. When the blogger behind Dwellings by Devore was renovating this bathroom for her teenagers, she decided to get the look of wallpaper using a stencil. The repeating flamingo pattern she created lends a playful touch to the room without breaking the bank. Here is a neutral teen bathroom with plenty of boyish appeal by Jaimee Rose interiors situated in Phoenix, Arizona. A nautical light fixture hangs above the vanity. The retro-inspired cast iron sink is by Kohler. The whimsical faucet print on the wall on the right conceals bathroom storage. Do not be afraid to mix and match decorating styles when creating a bathroom for your teenager. Goldrich Interiors based in London, England, designed this stellar example that is a mash-up of four distinct types of décor. The millennial pink subway tile makes a trendy statement. A midcentury console was transformed into a small vanity. Above it is an art deco mirror. On the wall on the left is a vintage medicine chest that is very shabby chic. Interior designer firm Kress Jack at Home used color and pattern to put a whimsical spin on this white bathroom created for two teenagers. The geometric floor tile is an on-trend feature destined to be an enduring classic. We adore the floating blue cabinets that open up floor space for additional storage solutions. Reflected in the mirror are more storage solutions. The yellow mirror on the right adds a splash of contrasting color.